Awhile back I wrote about if your teapot could talk, what kind of things it would say (actually, having several teapots, it turned into quite a chatter session). Since then, I expanded my wonderings into the imaginary “minds” of teapots and what commentaries they would make on their lives as teapots. So, here goes. First of all, not all teapots speak English. Some don’t even speak any language known to us humans. They are conversant in “teapot speak” (borrowing a term from George Orwell’s 1984 here – “new speak” was what was left of the language after government officials kept declaring certain words to be non-existent). 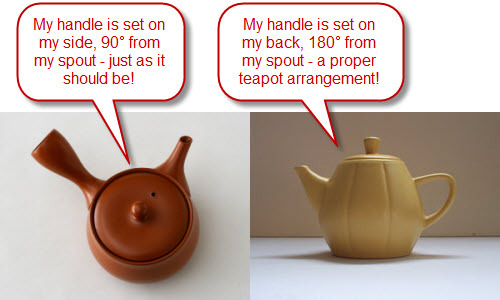 Some examples of this special form of communicating is “Tooooot TOOOOOT tootle!” (my “teapot speak” is a little rusty, but I think it means “The water’s too hot – you’re cooking, not steeping, those tea leaves!”). Many teapots are very linguistically talented and, due to spending time around us humans, tend to pick up whatever language we are speaking. In our house, it’s English, French, and a bit of German, with a Spanish phrase or two thrown in for good measure. For our purposes here, I’ll stick to English. Next time you’re steeping tea, lend an ear to your teapot. It could be trying to tell you something!